Rab was started in 1981 in the UK by experienced climber and mountaineer Rab Carrington. They specialise in making products “for the most extreme conditions in the world”. Originally manufacturing sleeping bags and now the range includes everything from t-shirts to full blown expedition gear. Rab were kind enough to send us a pair of Men’s and Women’s of these newly released Traverse shorts, so this review is from a Male and Female perspective. 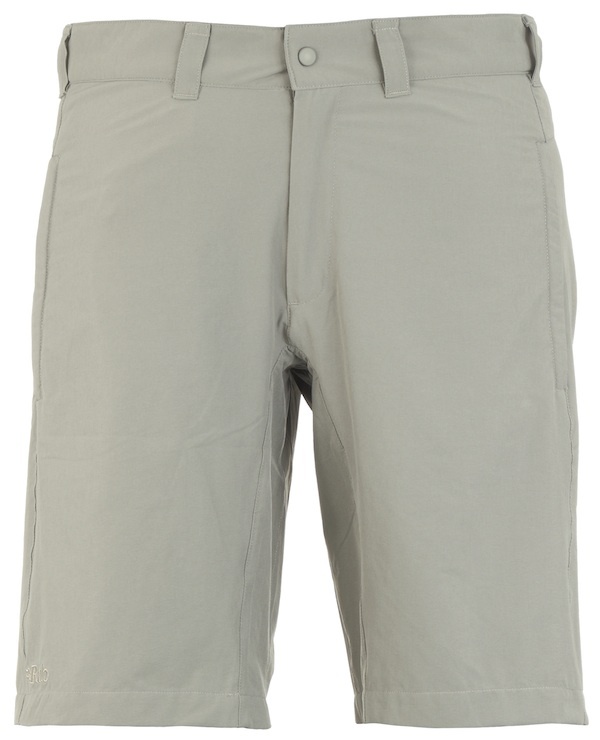 These are great looking shorts with some really nice attention to details such as the discreet Rab logo on the right leg and high quality YKK zips on all pockets aswell as a snap close fly. The fabric used for these shorts is incredibly comfortable with a huge amount of stretch due to a “diamond shaped gusset”. To be honest I’m not sure what that means but I can tell you that both the Men and Women’s have a very nice feel and no matter what position your in they never feel tight or restrictive. The Women’s shorts are cut further up the leg (mid thigh) than the men’s which come to the knee which our tester wasn’t keen on but this seems to be a trend with all manufacturers and isn’t restricted to a Rab design. Rab markets these as a multi-activity short for walking, climbing etc. I can definitely confirm their walking and climbing capabilities. They are ideal for the purpose as they provide un-restricted movement and have great breath-ability in sweaty situations remaining comfortable through-out. I was particularly impressed with how these shorts faired in our drip dry test, drying from soaking wet in an impressive 55 minutes. This would definitely come in handy in “sudden shower” or “wash in the sink” situations. Pockets are a slight concern with these shorts, there is just not enough of them. People may think from reading these reviews that I have a pocket fetish and this maybe the case but I do think 3 pockets is not enough. For day activities (hiking, climbing) 3 would be sufficient but for the serious traveller there is just not enough to carry all that you need. Rab have obviously put alot of thought into the pockets as they are very well placed and of a good size. The hip pockets in particular are slightly lower than normal allowing easy and quick access to the contents and all have good quality zips and are part mesh lined to enable cooling and drying. I can understand that filling these shorts with pockets would have increased the weight of these very lightweight shorts and so I believe this was a design choice aiming these shorts more towards short term travel and adventure activities rather than an oversight by Rab. One issue that prospective buyers should be aware of is the sizing of these shorts. When buying you should get a least the next size up from your normal size. This is most noticeable in the women’s sizing where the largest size of 16 is actually a 14, so some women may struggle to get their size. Not to much of a problem if you know in advance but as you will most likely purchase these shorts online it can be a pain to return them. Although I think it’s fair to point out that in all my dealings with Rab their customer service has been excellent and they are more than happy to help if you do have any sizing issues. These are a great pair of shorts for the active lifestyle, whilst I don’t think I would have them as a travelling short I would definitely recommend them for outdoor activities. The breath-ability and cooling properties are excellent and they are very comfortable through a wide range of motion. The women’s version are of a tighter fitting cut than the men’s but due to the stretching properties of the fabric they are not restrictive although our female tester said she preferred the loose fit of the men’s. There are currently deals on Rab clothing at some websites so you can get these a bit cheaper if you look around which does make them more appealing, but if your a person with an active lifestyle looking for performance wear you wouldn’t argue with the retail price. Providing you can get them in a size that suits these are well worth considering. *Shorts provided for review by the manufacturer. To have your Travel Gear reviewed on Vagabond Journey Travel contact us. Theres nothing really special about these shorts is they ? especially for 40 sods anyway ! I thought with Rab being maybe the best mountaineering clothes company in the business that they would of turned out something a lot better than these plain ordinary shorts in my opinion ! dont get me wrong I think Rab are an exceptional mountaineering clothes company and i personally have alot of Rab clothes+equipment BUT in my eyes these shorts are nothing special at all. Hi Kristian, I hear what your saying. Rab have an amazing range of mountaineering equipment and compare to that these shorts can seem a little bland and compared to the other shorts on test they are behind. Keep a look out for the rest of the tests we have some good ones coming up!